The number of people on antidepressant therapy has been steadily increasing over the past decade. Although considered effective antidepressants do have an enormous range of side effects, and these can impact cognition and driving ability. A person who is depressed may also already have impaired driving due to symptoms of the depression itself. In the first few weeks of antidepressant therapy, before the therapeutic effects of the drugs are evident, the side effects are often stronger as the body adjusts to the medication. When this is coupled with the already present symptoms of depression, the concern regarding safe driving is particularly important. To ignore the potential impact that depression and antidepressant therapy have on road safety could be dangerous or fatal. People who are dealing with depression sometimes have major memory and concentration problems and may also be dealing with suicidal thoughts. 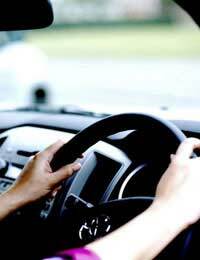 This can affect driving reaction time and can also leave a driver confused and struggling to focus. Some of the changes are ones you may notice yourself while other changes may be subtle or may even be pointed out by another person in the car with you. Of particular concern is that an individual who is thinking about suicide makes an immediate decision to harm him or herself by intentionally causing an accident. If you are experiencing suicidal thoughts, try to avoid placing yourself in situations where you may be triggered to act on those thoughts. If it means having to take alternate forms of transportation, such as the bus, consider making the change. It's better to be cautious than risk harming yourself or another person. Some of the side effects of antidepressant drugs may include visual disturbances such as blurred vision as well as confusion and dizziness. If you notice that your eyes are making it difficult to focus or read road signs properly, talk to your doctor about adjusting your antidepressant dose or trying a different antidepressant therapy. One study found that individuals on older antidepressant therapy such as tricyclics (TCA) had poorer driving performance than those on the newer selective serotonin reuptake inhibitors (SSRI). Older people who are depressed may have unique challenges with cognitive functioning and these can be potentially dangerous while operating a vehicle. The attention span and reaction time may already be decreased due to depression and problems with functioning can be further increased by age. Some antidepressant medications can cause blurred vision and this can be particularly concerning when coupled with the often poor visual capacities of the elderly. Your doctor will take all of these factors into account when advising you on road safety. If you are taking antidepressants, be cautious and monitor your driving. Read instructions for medication use carefully and note any specific cautions about side effects that may affect driving ability. Considering the large number of people with diagnosed depression who are on antidepressant therapy, it is hoped that research will provide more information about the impact these factors have on driving ability. Until then, it's important to be aware that your antidepressant therapy can influence your driving ability and if you have concerns, you should avoid driving and speak with your doctor until he or she has confirmed you are able to get back on the road. Depression is horrible. Soul destroying. Iv just passed my driving test, first ti,e? Just got a new car and my nerves are all over the place.